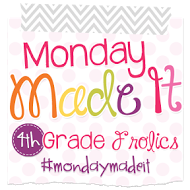 If there is anything I really love about summer, it is Monday Made It with Tara from Fourth Grade Frolics! I love the ideas I get from other teachers for my classroom, and I love being able to share my ideas and creations with others. You can always head over to Tara's blog and link up, or follow the links at the bottom to see some fantastic ideas! Just click HERE to head there now! And without further adieu...here is my first Monday Made It of the summer! 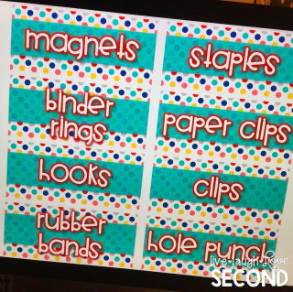 Teacher Toolbox Labels: Okay, okay...so they're not exactly finished, but I made new labels for my teacher toolbox. All I need to do is print them out and laminate them. I am a fan of putting the labels on the outside of the drawers because they have a weird bump on the inside. I'm also contemplating spray painting the frame, but...I want to see how it looks with the new labels first. Stay tuned for an updated picture once I'm done! Oh! And if you've ever wanted to created your own labels, I do have a tutorial video that you can watch HERE. They are so easy to make, I promise! Fluffy Slime: This was so much fun to make with my 4 year old. We used a mashup of different internet recipes, which means we basically used the ingredients we had on hand at home. It was really easy, and Emmy played with it for hours! When she was done, we stored it in a gallon-sized Ziplock bag. It did "deflate" a bit, but she is still playing with it! Wooden Sign: I made this for our school counselor. 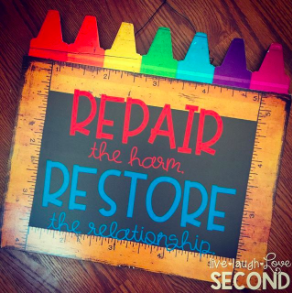 She has been doing a lot of work with Restorative Justice, and a main component within it is to "repair the harm, restore the relationship." I thought this would be a fun addition to her office! The wooden sign was from Kirklands. I bought 2 of them over 2 years ago for dirt cheap on clearance, like $5, thinking they would make great signs one day! I used my Silhouette Cameo 3 to cut the letters. The large font is AG That's A No From Me, but I can't remember what the small font was, and since I welded it in my software, I can't figure it out. Sorry! I just love it! T-Shirt: I was asked by one of Em's teachers to create a last-minute shirt for a dance recital after one of the little girl's arrived messed up. I'm still trying to make sense of the saying, but...it turned out pretty cute! I also loved that I was able to save the day for someone! I love your sweet giving heart! I'm sure that you're a joy to be around! Also, the majority of shirts now days make no sense to me whatsoever. However, when I find one I adore, I just send the picture to my sister that has a shirt making business, and I have a nice new shirt in a jiffy. It's pure excitement. Slime is always a huge hit with my kiddos. Thanks for sharing! Where can I see the video for the labels? The link appears to be broken. Such cute ideas! My students loved slime...but I banned it from my room. Love your sign! Pam at PJ Jots - Please visit me!